Published on 24 April 2012. I have no doubt that Jensen, my eight year-old nephew, is far more of a dinosaur expert than me, yet I’m fairly sure that this is a life-size tyrannosaurus rex (albeit one with a slightly rusty hip). 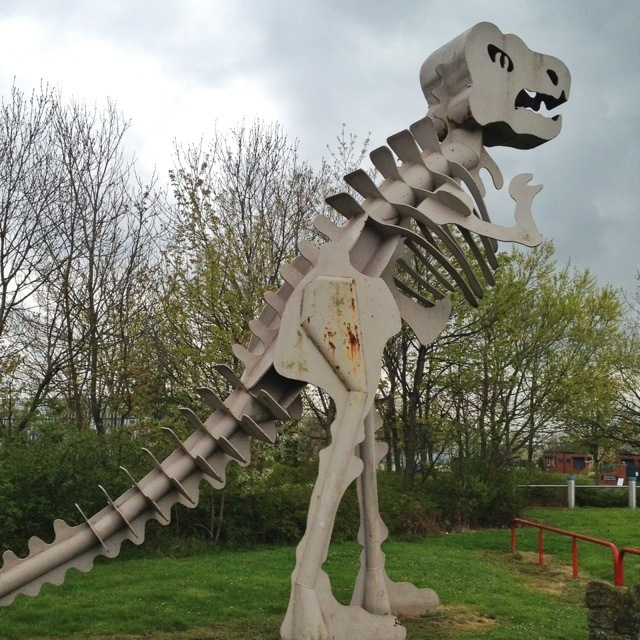 I spotted it earlier today at Teessaurus Park, on the bank of the Tess in Middlesbrough. If you were ever a fan of Sim City 2000, you’ll remember that putting parks in industrial areas tended to improve the perceived land quality, and help your city to thrive. Teessaurus Park seems to have been based on a similar premise, based as it is very close to Middlesbrough’s industrial heart. This 1,620th post was filed under: Photo-a-day 2012, Dinosaurs, Middlesbrough. Published on 4 April 2012. 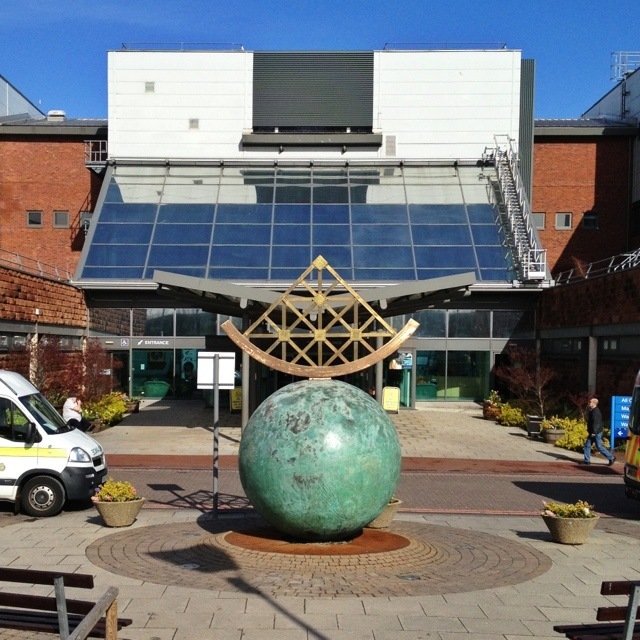 This is “Cook’s Earth”, Andrew Burton’s globe and sextant sculpture outside the South entrance to the James Cook University Hospital in Middlesbrough, where I had a meeting this morning. I also did a few of my medical school rotations here. It, of course, commemorates everybody’s favourite 18th century Middlesborian*, the seafaring discoverer of Australia. The globe used to be more clearly globe-like, with a blue sea, but that seems to have washed off. A replica of his most famous ship is down the road in Stockton, as I showed back in January. James Cook’s violent death is captured in a famous Zoffany painting; so perhaps it’s appropriate that the hospital named after him is leading the country as a regional specialist trauma centre. Although, given the number of areas in which the hospiral’s highly respected, it’s hard to think of a mode of death for Captain Cook that would preclude me from drawing a tenuous link…! *Marton, where James Cook was born and his eponymous hospital stands, was actually considered a village in Yorkshire in the 18th century, rather than a suburb of Middlesbrough, so I guess whether or not he was Middlesborian is a bit of a philosophical question! This 1,591st post was filed under: Health, Photo-a-day 2012, Art, James Cook, Middlesbrough.